As Cameroonian authorities investigate horrific crimes that appear to be have been committed by government soldiers in the Far North Region, the U.S. military is calling for accountability while it continues to provide training to its Cameroonian counterparts. "The Cameroonian government has taken recent steps to increase transparency and address allegations of gross violations of human rights seriously, but the government has not yet released information specific to its investigations," Pentagon spokeswoman Air Force Maj. Sheryll Klinkel said Thursday in an email to VOA. The Pentagon is continuing to work with the State Department to "ensure the government of Cameroon holds accountable any individuals found to be responsible," Klinkel added. Cameroonian authorities arrested seven Cameroonian soldiers after two videos circulated on social media. 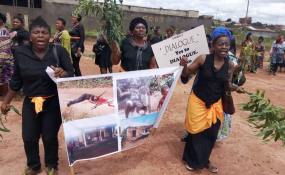 One video showed what were alleged to be Cameroonian forces shooting two women and two small children, while another showed what appeared to be Cameroonian security forces shooting at least a dozen unarmed civilians during a counterterror operation in the Far North Region. An investigation by the BBC used satellite imagery, Channel 4 News footage and clues from the video to assert the killings of two women and two children were committed in the Far North by Cameroonian soldiers between March 20 and April 5, 2015. Former President Barack Obama deployed U.S. military personnel to the country about six months after that incident, in October 2015, to help in the fight against Boko Haram. The Department of Defense still has about 300 military personnel in Cameroon as part of an international effort to stop the spread of violent extremism in West Africa. In addition to what the Pentagon calls "building partner capacity" through basic military training and equipping, the Defense Department trains foreign troops on the law of armed conflict and human rights. The Cameroonian Ministry of Defense also takes part in a U.S. government-funded program to train and establish 40 military legal advisers to advance human rights principles and promote security force accountability in the field commands across Cameroon. Gen. Thomas Waldhauser, head of U.S. Africa Command, cautioned before the Cameroonian government arrests that partnership with the U.S. comes with responsibility. "We want to have a strong military relationship with Cameroon, but their actions will go a long way toward how that will play out in the future, with regards to the transparency on some of these latest allegations," Waldhauser said on July 31.